Q: Why do mathematicians often confuse christmas and halloween? A: oct 31 = dec 25. Q: Why didn’t Newton discover group theory? A: Because he wasn’t Abel. A mathematician: Pi is the ratio of the circumference of a circle to its diameter. A computer programmer: Pi is 3.141592653589 in double precision. A physicist: Pi is 3.14159 plus or minus 0.000005. An engineer: Pi is about 22/7. A nutritionist: Pie is a healthy and delicious dessert! half-empty. To the engineer, the glass is twice as big as it needs to be. Q: What is the first derivative of a cow? When it’s cold, what do mathematicians do? Stand in the corner, there it’s always 90 degrees. F i bb ooo nnnnn aaaaaaaa ccccccccccccc ccccccccccccccccccccc iiiiiiiiiiiiiiiiiiiiiiiiiiiiiiiiii. Q: Why did the mathematical biologist get her nose pierced? A: She wanted to change her genus. Q: Do you already know the latest stats joke? The number you have just dialed is imaginary. Please turn your phone by 90 degrees and try again. Did you know almost all humans have more legs than average? An infinite crowd of mathematicians enters a bar. The first one orders a pint, the second one a half pint, the third one a quarter pint… ”I understand”, says the bartender – and pours two pints. Q: How often can one subtract 7 from 83 and what’s the rest? A: You can subtract 7 from 83 as often as you like and the rest will always be 76. When a mathematician writes a fantasy book, are the page numbers imaginary? Question: What is the difference between an introverted mathematician and an extroverted mathematician? Answer: An introverted mathematician stares at his own feet while talking to you, while an extroverted one stares at your feet. 5 out of 4 people have problems with math. Mathematics are like Divinity. You feel both fear and respect for them, they’re both imaginary and real in some sense, and they are always accompanied by an unending and futile effort to understand them. A physicist, a biologist and a mathematician are sitting in a street cafe opposite an empty house. They see two people go into the house. Time passes, and after a while they see three people walk out of the house. Life is complex. It has a real part and an imaginary part! Teacher: What is 2k + k? C programmers have been seen to press “3″ to get to the fourth floor. A large mathematicical conference was once held in Las Vegas, heavily sponsored by the city authorities. However, it was decided not to repeat the offer because the mathematicians showed no interest in the casinos or gambling. Math is like love. It’s a simple idea but it gets complicated. A man went to the post office to post a fishing rod which was five feet long and all in one piece. He was upset to find that the maximum parcel length the post office would accept was four feet. He solved the problem by placing the fishing rod diagonally in a rectangular box of length four feet and width three feet. Teacher: Who can tell me what 7 times 6 is? Teacher: Very good! – And who can tell me what 6 times 7 is? An investment firm is hiring mathematicians. After the first round of interviews, three hopeful recent graduates – a pure mathematician, an applied mathematician, and a graduate in mathematical finance – are asked what starting salary they are expecting. “Well, I thought of $135,000 for me, $135,000 for you – and $30,000 for the pure mathematician who will do the work. Q: What do you get when you add two apples to three apples? A: An American high school math problem, apparently. News headline: Statistician drowned in river with an average depth of 10 cm. Jesus Christ could never have become a professor of mathematics. All are agreed that he was a wonderful teacher, but he never published anything. Teacher: Marion, what’s 4 plus 4? Marion: If I had known that I would have said 100. An infinite number of mathematicians walk into a bar. The first one orders a beer. The second orders half a beer. The third, a quarter of a beer. 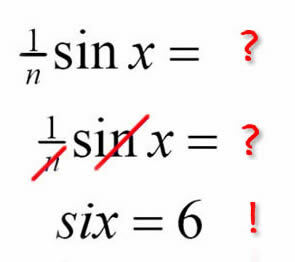 Before the fourth mathematician can place his order, the bartender says “You’re all idiots”, and pours two beers. Q: what is the difference between a phd in mathematics and a large pizza? A: a large pizza can feed a family of four. The interviewer asks: What is 2+2? The accountant says: What do you want it to be? How does a phisicist prove that all odd numbers are primes? 3-yes. 5-yes. 7-yes. 9-mesuring error. How does a computer engineer prove that all odd numbers are primes? How does a biologist prove that all odd numbers are primes? How does an arts graduate prove that all odd numbers are primes? How does a grade school student prove that all odd numbers are primes? 3-yes. 5-yes. 7-yes. 9-high school material. How does a high school student prove that all odd numbers are primes? 3-yes. 5-yes. 7-yes. 9-isn’t on the test.